We went on our first hike the evening we arrived, going up Tunnel Mountain. It was a three-mile round trip with multiple stopping points along the way to rest and check out the view. After a day of driving and the short hike up Tunnel Mountain, we headed downtown. Banff Avenue has a plethora of food and shopping options. 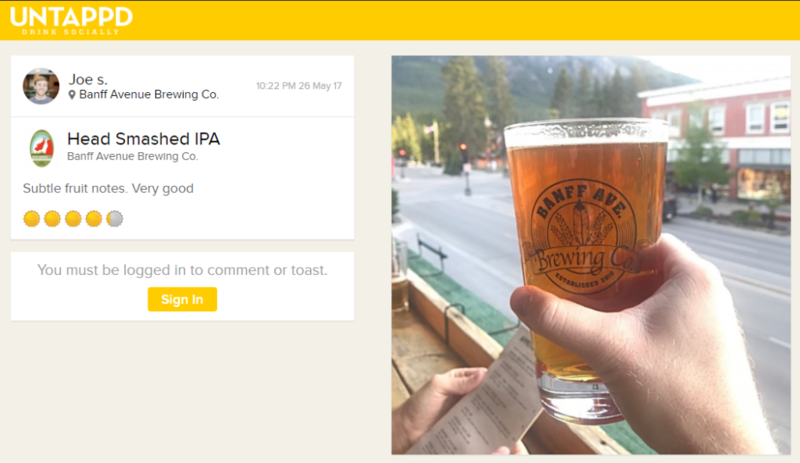 In my quest to try beers everywhere, we checked out Banff Ave Brewing for great beer and tasty brewpub plates. There are plenty of places to go out in downtown, from pub to club. We checked out two live music spots before heading back to the hostel for a late evening of Karaoke. 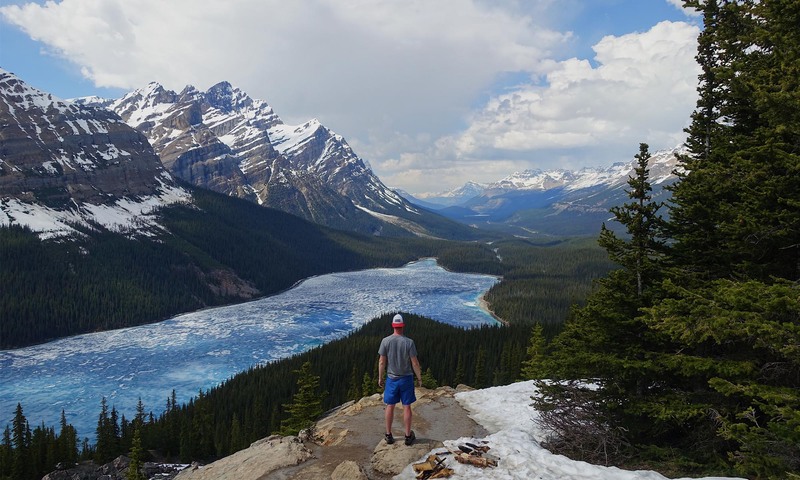 The second part of the trail splits toward an overlook along Lake Minnewanka, which is up to 35 miles down and back of trail and back-country camping. Overall, this part of the hike was flat and uneventful. After refueling on granola, we set back to Banff to see the Vermilion lakes. No hiking is required and the lakes are right off the road entering the town. It is the perfect spot for a photo of sitting on a pier staring out at the mountains. For us, it was the perfect spot to cool our feet after our hike. The final hike of the day was up Sulfur mountain. At 3.5+ miles with 2,000+ feet of incline gain, it is a workout. At the top are 360-degree views of the surrounding area. It is spectacular and if you head down after 6, the gondola ride back is free ($18 otherwise). You can also skip the hike and ride the gondola, but where’s the fun in that?! The focus was a bit off on my camera, but for my first time shooting the northern lights, I am excited with what I got. We had the best meal of our trip for breakfast at The Juniper Bistro at The Juniper Hotel. Away from the crowds of downtown Banff, the bistro has incredible stuffed french toast which I devoured before I took a picture. Our waitress recommended alternative hikes and sights, so we changed our plans. We headed an hour north past Lake Louise toward Field, British Colombia and Yoho National Park. Our first stop was The Natural Bridge (0-25 seconds in video above). We decided to take it easy on our legs, so we headed to Emerald Lake and canoed around for two hours. The lake was incredible, and a great way to get sun and enjoy the scenery. Ice cream is available at the store and highly recommended after spending time on the water. Our final stop in Yoho National Park was Takakkaw Falls. The road that leads up to the falls is closed Oct-June, and we fount out why the hard way — rocks, knee-deep snow, and an avalanche on the road. The view is incredible, especially as the sun sets on the falls. The hike up and back was filled with people. The snow was packed, but there were some slippery spots and places where you can fall in up to your thighs. The hike is only one mile down and back, so it is very accessible and well worth the trek. The stunning blue color of the water was just starting to peek through the ice. Our next stop was right down the road, at Bow Lake. The hike was around the lake to the falls, and finally to the glacier. Six miles total, the hike has some really unique views. Our final stop for the day was Lake Louise. With the Fairmont Chateau at the lake, the trail is flat and easily walkable at around 3.5 miles down and back. That night we stayed in a remote hostel at Castle Mountain. There was no WiFi, which made for a nice change. There was an eccentric host to keep us entertained, and for once we got to bed at a decent hour. The hostel host recommended checking out the Castle Mountain lookout in the morning, so we switched up our plans. The trail was 2.5 miles both ways, with a semi-steep incline the whole way up. 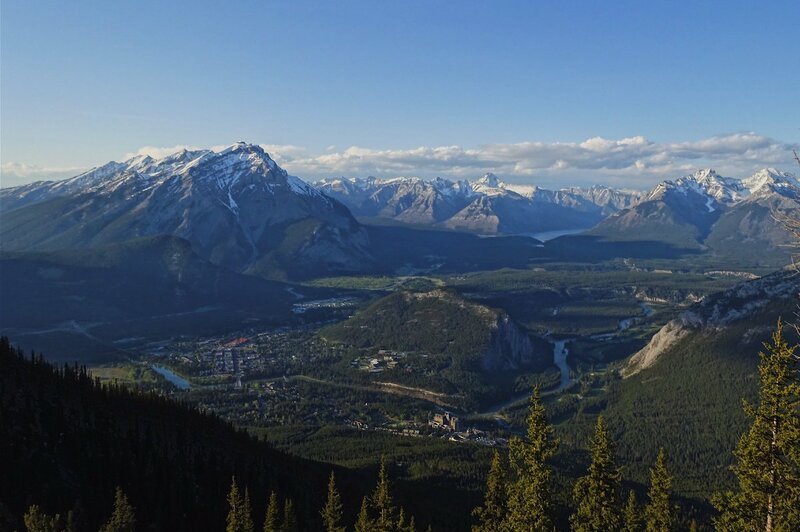 The sweeping panoramic views of Bow Valley were incredible. Our next stop was Bow Valley Falls. This area was filled with visitors. The Lower Falls is a little less than a mile hike away, and you can go through a small cave to view them from below. The Upper Falls are another mile down the trail, snaking 20 feet above the river below. You have to fight through crowds, but the falls are pretty cool. Finally, the hike to the ink pots is all uphill, but it makes for a much more peaceful journey. The vivid colors of the pools and lush landscape are worth taking your boots off and staying a while. The final stop was at Moraine Lake. The lake was beautiful, but unfortunately it was 95% ice. After an exhausting few days we decided to walk down to the waterfront, snap a few pictures, and headed back to Calgary for our flights home the next day. Overall this trip was exactly what I needed after leaving RV. Being able to spend time outside, hike and enjoy the scenery was incredible. Did you enjoy this write up? Check out my write up of my trip to Ecuador and Subscribe to get monthly updates on my adventures.